With his slick linework, organic compositions, and imaginatively magical aesthetic having secured him a solo exhibition at an Old Colorado City-based furniture and decor shop in early 2012, artist Mike Fudge admits that the “last five years have been a crash course in the business of art and utilizing my skills to become a professional”. But he must’ve been doing something right, as his acclaim and recognition have been steadily growing over those intervening years. His talents have been enlisted for concert poster designs by bands like Blink-182, Primus, The Pixies, and Pearl Jam. Last year saw him invited to create a 50-foot-long mural as part of Kaiser Permanente‘s multi-state Find Your Words campaign. And this year he’s debuted his first factory-produced designer toy with Kidrobot, the Kuba Dunny, though this wasn’t his first time working with the brand. “I have always loved art and started drawing as a child”, Fudge notes, stating that even then he “wanted to grow up to be an artist”, though at the time “that meant a cartoonist or comic illustrator”. But when he “was around 19”, Fudge remembers, “a friend introduced me to graffiti”. And while he “fell in love” with street art, with Fudge even crediting it as what “sparked my current run at creating artwork”, he was never creatively complacent. “During that time”, he recalls, “I found out about other styles of art and spent a lot of time trying them all out”. And while “I found my place mainly in illustration” by 2012/2013, Fudge expresses that he had a continued “love to experiment” artistically. Enter Kidrobot into Fudge’s life, offering the artist a rather tantalizing opportunity. “I believe I was contacted by Kidrobot through Instagram”, Fudge recalls, the company ultimately offering him to hand-paint vinyl figures to be displayed at their five retail locations in June of 2013. “I was familiar with Kidrobot before this”, says Fudge, “and many of the artists I admired had done production pieces with KR”, as the brand’s name is often abbreviated. “Those Munnys and other platforms I painted for the displays”, Fudge elaborates, “were pretty much my first attempts at making custom toys”. True to the style he’d already started becoming known for, Fudge created hand-painted designer toy works that incorporated anthropomorphic animal aspects which were imbued with mystical elements inspired by ancient cultures and traditions, with the artist especially inspired by the Native Americans of the Ute tribe that were prevalent in the region Fudge calls home. In fact, regarding these hand-painted designer toys, while “I like to think they all have their own personality and identities”, Fudge says, he also envisions that “they are still all part of the [same] tribe”. 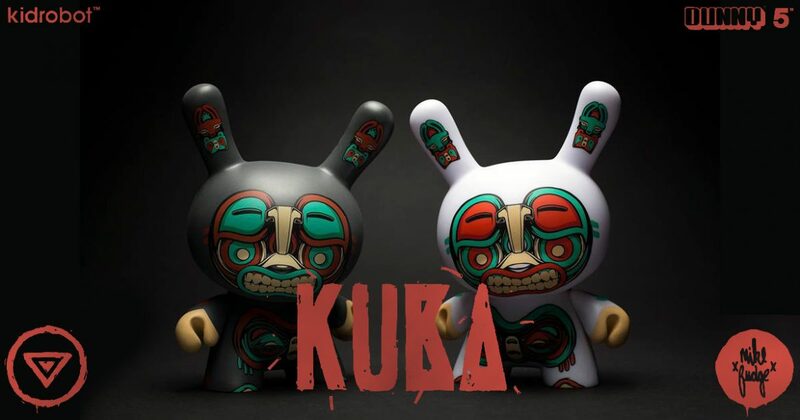 And this concept was carried through by the artist to his factory-produced Dunny with Kidrobot, a limited edition vinyl form that he’s titled Kuba. “I think of Kuba as a sculpted figure created by a member of this imaginary tribe”, says Fudge of his totemically styled Dunny decoration. Noting that the piece’s title “comes from the human-like bear characters I often name Kub”, Fudge explains that the “story of Kuba relays that the figure has been uncovered in ancient sites all over the world, suggesting there is a connection and contact [between these cultures] that we knew nothing of previously”. And if “all these cultures had previous contact amongst each other”, the artist ponders of his piece’s fictional backstory, “then maybe there is something we have yet to find out about their ability to communicate or travel”. As a potential answer to his own hypothetical question, Fudge muses that maybe “it was Kuba who allowed these ancients to transcend the laws of the universe and spread what seemed like impossible knowledge to every corner of the earth”. But the powers accredited to Kuba don’t end there, according to its creator. The “dark version of Kuba“, which is limited to 1300 pieces worldwide, “can bring upon its owner the ability to see into the future and peer into the past”, says the artist. Click Here to Acquire Mike Fudge’s Kuba Dunny from Kidrobot, or Click Here to Find a Kidrobot Retailer to Order it from.